Sale Sharks produced a resolute performance to secure a bonus-point victory over Worcester Warriors at the AJ Bell Stadium. Danny Cipriani went over for the hosts early on before David Seymour crashed over for a second try either side of two Ryan Mills penalties for Warriors. Josh Beaumont touched down for Sale after the break before Jonny Arr scored for the visitors. However, Johnny Leota secured the bonus point with a try in the last minute. Worcester Warriors have now lost their seven meetings with Sale Sharks, having not won since a 23-16 victory at Sixways in October 2012. Steve Diamond's Sale, who suffered a 41-3 thumping at champions Saracens on the opening weekend of the season, got off to the ideal start against Worcester when England fly-half Cipriani jinked through a gap to touch down. Mills gave the visitors a brief lead by sending over two pinpoint penalties from halfway, before Sale flanker Seymour bundled over following a driving maul. Cipriani, who had been uncharacteristically wayward with the boot in the first half, missing both conversions and a penalty, finally slotted a three-pointer just before the break to extend the advantage to 13-7. Beaumont, son of former England captain Bill, scored Sale's third try from the base of the scrum, before Arr gave Warriors a lifeline when he dived over in the corner following some quick hands from skipper GJ van Velze with 20 minutes to go. But Dean Ryan's side, who had beaten 2014 champions Northampton 13-12 seven days ago, were unable to build on their first real attack as Sale closed out the match in Warriors' 22. Leota eventually crossed over for the Sharks' fourth try and a bonus point, which at the same time denied Worcester a losing bonus point. "We didn't have to play any flash rugby - it was just a case of putting numbers to rucks, clearing them out and trying to get some dominance. 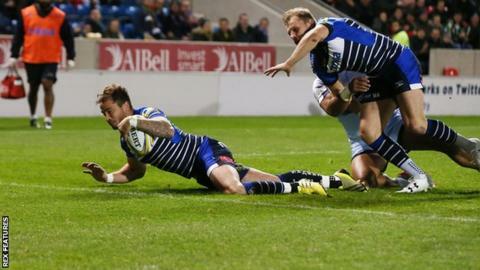 "We got that, certainly at the driving maul, and overall Danny Cipriani and Chris Cusiter managed the game well for us. "It was a tough encounter. The league is now far stronger with Worcester in it, so credit to us for getting that bonus point at the end. We probably deserved to win. Hopefully we won't perform like we did last week again." "We're disappointed that we didn't close the game out and get that point. "Not many teams win at Sale so to get a point here, with the amount of pressure we had been under, would have been a big achievement, so we're a little bit deflated. "But we lost it because of ourselves and we should have been smarter in seeing the time out on the clock. That's just a learning curve for us because every point is going to be important for us this season." Sale Sharks: Haley; Arscott, Leota, Tuitupou, Addison; Cipriani, Cusiter; Harrison, Taylor, Cobilas, Evans, Mills, Braid (capt), Seymour, Beaumont. Replacements: Briggs, Flynn, Mujati, Ostrikov, Ioane, Stringer, Macleod, James. Worcester Warriors: Pennell; Vuna, Olivier, Mills, Biggs; Heathcote, Arr; Leleimalefaga, Annett, Schonert, O'Callaghan, Barry, Dowson, Mama, Van Velze (capt). Replacements: George, Rapava Ruskin, Rees, Cavubati, Cox, Mulchrone, Lamb, Howard.